Robert Arnott, resplendent in a purple-check jacket, purple-striped shirt, and purple-print tie, is regaling his staff with tales of his favorite hobby: chasing solar eclipses from the ice floes of Antarctica to the singing sand mountains of the Gobi Desert. The scene is the ritual daily luncheon inside the cavernous conference room at Research Affiliates, Arnott's fast-growing eight-year-old investment research firm in Newport Beach, Calif. On this sunny Thursday in April, Ph.D.s from as far away as China and Russia sample Turkish cuisine, share ideas for applying game theory to portfolio design, and swap ferocious forehands at the Ping-Pong table. It all has the loose, zany vibe of the cafeteria at a university research lab. Arnott is well-suited to the role of mad professor. The burly, goateed 55-year-old plows through life with a nonstop enthusiasm that he channels into an assortment of extreme hobbies. He is an avid collector of both the world's fastest vintage motorcycles -- he recently paid $100,000 for a Morbidelli from Italy with a miniature Ferrari engine -- and the graffiti art of Banksy, the phantom underground British painter famed for masking his identity. But Arnott loves nothing more than retelling his eclipse-seeking adventures. In his rich bass voice, Arnott recounts an epic expedition to Paraguay in the mid-1990s. "We drove nine hours on dusty, bumpy roads to a tiny cow town called Filadelfia," he says. "We hopped the fence of a ranch to see the eclipse, and the owners rushed over to kick us off. When we explained that this happens once every 360 years and only lasts five minutes, they stayed and were mesmerized. A woman cried tears of joy when she saw the moon blot out the sun. I've seen that reaction many times at eclipses." When he's not circling the globe in search of celestial rapture, Arnott is easily one of the most important figures working in the investment world today. At Research Affiliates he has created a menu of exchange-traded funds, mutual funds, and other offerings that now manage a total of $52 billion (most through indexes licensed to big institutions). But his influence extends well beyond the size of those portfolios. Arnott's innovative approach to designing and marketing index products has rocked the investment world. "No one is having a bigger impact in reevaluating the full and hidden costs of conventional indexing," says Brent R. Harris, a managing director at nearby Pimco, the $1 trillion money management colossus for whom Arnott directs a family of funds. "He's also creating a better alternative with a proven track record." Arnott's Big Idea is a concept he calls "fundamental indexing." It's a system that allocates money to stocks based on the economic footprint of the underlying companies rather than by the more common method of market capitalization. As we'll see, it's a near-revolutionary challenge to the accepted wisdom about passive investing. And it has already won over a range of large institutional clients, from the national pension fund of France to CalPERS, the $200 billion retirement fund for California's public employees. "Rob is one of a handful of guys on the cutting edge of investment thinking," says Dan Bienvenue, a senior portfolio manager at CalPERS. "In conventional indexing you're always average. Rob's method has historically beaten the average." Arnott hasn't just beaten his competitors -- he's thrashed them. Although Research Affiliates manages money directly for select clients, its main business is inventing index funds and licensing them to institutions and brokerage firms, chiefly through index distributor FTSE. Over the past five years Arnott's flagship index, the FTSE RAFI US 1000, offered as a mutual fund (SFLNX) by retail giant Charles Schwab and an ETF (PRF) by Invesco PowerShares, has delivered returns of 4.3% a year through tumultuous markets, beating the S&P 500 (SPX) by 2.4 percentage points annually. And his $21 billion All Asset funds, which invest in a wide variety of securities from around the globe and which Arnott personally manages for Pimco, have garnered 8.6% average annual returns since 2002, vs. 7.5% for the MSCI world equity index -- and have done it with much less volatility. Those extra percentage points of return look especially enticing right now, for a basic reason: The odds are that the investments of U.S. retirement savers won't live up to their expectations. Most academics agree that with current low bond and dividend yields -- a mere 3.2% and 1.8%, respectively -- traditional portfolios will produce lackluster longterm returns. Arnott argues convincingly that investors employing the standard mix of around 60% stocks and 40% bonds will be stuck with returns in the 5% range for years to come. For the majority of people that figure won't come close to satisfying their income requirements when they reach retirement age in 2030 or 2040. But Arnott swears that the power of fundamental indexing can lift the annual return to around 6.5% for a blend of stocks and bonds. Has Arnott created a magic market-beating formula? Or is his success a combination of good luck and marketing bravado? Investors are wise to question any solution that pledges the seemingly unachievable blend of higher returns and lower risk. But a detailed examination of the impressive science behind Arnott's creations, how they were developed, and how they performed through one of the most perilous, volatile markets in history gives credence to his claims. One thing is for sure: Arnott's confidence in himself and his system is absolute. "Most advisers are telling you to build a retirement house with a hammer," he says. "I'm giving you everything from power saws to insulation -- the full tool kit." Arnott relishes nothing more than the purely intellectual side of investing. He grew up in Claremont, Calif., near Los Angeles, the son of a divinity school professor. "I got my passion for missionary work in investing from my dad," he says. At age 8, he calculated the slope of the earth's surface and arrived at the right number: eight inches per mile. But he abandoned thoughts of becoming an astronomer after attending a six-week physics and astronomy camp while in high school. "The other kids were just too good in math for me to compete," he says. "So I decided to concentrate on finance." At the University of California at Santa Barbara, Arnott majored in economics, math, and computer science. He never earned a doctorate, but he became enthralled with the idea of translating the arcane finance theories he studied into popular investment products. It was the bursting of the tech bubble in 2001 that gave Arnott the idea for fundamental indexing. At the time Arnott was working for pension fund manager First Quadrant. George Keane, a veteran money manager who served on the investment committee of the giant New York State Common Retirement Fund, kept telling Arnott, with ever rising alarm, that the way index funds were automatically shifting more and more money into wildly overpriced tech stocks was a recipe for disaster. At their peak, tech and telecom shares accounted for an incredible 45% of the capitalization of the S&P 500, while comprising around 15% of the sales and assets. Keane's fears were justified: The enormous weightings in tech stocks dragged down index funds when the bubble burst. So in 2002, Keane and Marty Leibowitz, chief investment officer of pension fund giant TIAA-CREF, prodded Arnott to find a method for tying holdings in individual stocks to a measure that reflected their size in the economy rather than to prices that swung violently with fads and frenzies. Arnott, who had just founded Research Affiliates, saw an opportunity to gain favor with institutions and individual investors burned by the meltdown. He began to intensively study the performance of portfolios weighted by sales, dividends, and other measures compared with that of cap-weighted funds, such as the Vanguard 500 index fund. One finding absolutely stunned him: From 2000 to 2002, the average stock in the Russell 3000 rose by 20%, while the index fell by 20%. Arnott quickly concluded that companies weighted by size, using almost any criteria, consistently outperformed capweighted indexes. For his index he settled on a formula that takes the average of four yardsticks: sales, cash flow, book value, and dividends. When companies pay no dividends, RAFI simply averages the other three. Over a 42-year span he found that a hypothetical index weighted by those four measures returned 2.1% more per year than cap-weighted funds. The advantage has been borne out since Arnott launched his indexes in late 2004. And a host of empirical studies by other researchers have proven that fundamental funds consistently beat cap-weighted competitors -- typically by about 2% annually. Why do fundamental indexes fare far better? The principal reason is that they are regularly rebalancing their holdings by selling expensive stocks and buying cheap ones, relentlessly exploiting what's known as the "value effect." It's well established, both in academic studies and through decades of fund performance, that "value stocks," companies with low price/earnings multiples and low price/book ratios, perform better over time than expensive growth stocks that boast high P/Es. "The market does a good job choosing which companies will grow and which will shrink," says Arnott. "The problem is that investors pay too much for hot, glamorous growth stocks and set the bar too high." In the fundamental index, the rebalancing goes strictly by formula: When a company's market cap jumps faster than its sales or profits, the fund sells just enough of it so that its investment once again reflects not its price but its scale in the economy. Arnott's critics claim that he's simply repackaging the value effect and calling it something revolutionary. "This is just old wine in new bottles," charges Cliff Asness, chief of hedge fund AQR Capital. "But I like the product." Arnott agrees that the value factor accounts for a lot of his outperformance but maintains his formula for systematically rebalancing into cheap stocks makes his fund far different, and far more original, than a cap-weighted value fund. "We're constantly trading against the market's most extreme bets," says Arnott. How about costs? Arnott's promises don't count if his extra returns are absorbed by big fees and trading expenses. But Arnott keeps costs down by rebalancing just once a year, in March. The PowerShares FTSE RAFI US 1000, an ETF, carries an expense ratio of 0.39%. The mutual fund version of Arnott's RAFI 1000 offered by Schwab runs 0.35%. Those numbers are far higher than the 0.09% that the iShares S&P 500 ETF (IVV) charges. But they're well below the fees of 2% or even higher for actively managed mutual funds and comparable to the costs for specialized or "enhanced" index products that invest in such niches as small-cap equities or value stocks. The performance of the RAFI 1000 since the market peak in late 2007 is a fascinating primer in the virtues of fundamental indexing over cap weighting. In general, the bigger the gap in valuation between value stocks and growth stocks, the better that fundamental indexes perform. And by late 2007, after a banner year for growth stocks, there was a deep gulf between the two. When it rebalanced in March 2008, the RAFI gorged on ailing bank stocks such as Bank of America (BAC, Fortune 500) and Citigroup (C, Fortune 500), downtrodden automakers such as Ford (F,Fortune 500), and assorted industrials. The timing seemed perfect for the fundamental index to beat the traditional cap indexes, even in the dreadful market of 2008. It didn't happen. Growth stocks did poorly, but value stocks fared even worse. The RAFI 1000 lost 40%, vs. 37% for the Russell 1000. "Investors weren't asking when these value companies would rebound but whether they'd survive," recalls Arnott. But the RAFI 1000 didn't blink. In March of 2009, with the market at its nadir, it doubled up on the cheapest stocks just as it had in 2008 -- this time at absolutely rockbottom prices. Says Arnott: "We traded against the greatest fear-driven market of our generation." The relentless push against the tide paid off when the market roared back, and the downtrodden roared loudest. In early 2009 the RAFI had 12% of its money in stocks selling under $5 a share, compared with 1.5% for the Russell. Over the next year those shares gained an incredible 116%. Consumer discretionary holdings in the RAFI jumped 167%, while the same sector in the Russell increased by 83%. The RAFI's overweight in financials gave it a 26-point edge when those stocks rebounded. All told, from March 2009 to April 2010, the RAFI beat the Russell by 30 points, 84% to 54%. After the big rally over the past year, stocks would appear to be extremely expensive. But Jason Hsu, one of Arnott's chief lieutenants, says that while tech and health care are carrying prices far in excess of their economic size, a lot of big companies still appear cheap, including financials, industrials, and large retailers. The cap-weighted funds, however, are putting half their money in just one-quarter of the stocks, an unusually large bet on expensive companies. In other words, the market is paying dearly for growth that may not happen. Arnott is confident how things will turn out. "When the gap between the cheap and the expensive is this big," he says, "the fundamental index usually outperforms by more than the traditional two points." Ironically, despite his incredible success with fundamental indexing, Arnott isn't a big fan of equities -- at least not at these prices. With yields so low, he doesn't think bonds will provide enough of a cushion from the volatility of stocks in years to come. Plus, he fears that the U.S. is headed for a bout of inflation as a result of the Fed's expansionary policies and the mountainous federal debt. "In an inflationary environment," says Arnott, "both stocks and bonds do poorly." But Arnott has a solution for combating inflation: the Pimco All Asset funds, in which he employs an active rather than a passive strategy. He acts much like a hedge fund manager, handpicking an ever-shifting mix of assets from around the world by using an array of some 40 different Pimco funds. He's the only outside manager Pimco has ever invited to run one of its funds, and he's allowed free rein to buy and sell as he chooses. Right now he's avoiding risky assets like junk bonds in favor of those that should prosper in an inflationary environment. Among them are TIPS, which pay investors an extra yield that corresponds to the rise in the CPI; emerging-markets bonds that do well when raw material prices increase, since developing countries are typically rich in everything from oil to copper; and REITs, which recoup inflation by raising rents on their office towers. He admits that continuing to deliver the 8.6% average returns the All Asset fund has achieved over the past eight years won't be easy. Not that he's doubting himself. "The only way to get to that 8% or more is to trade opportunistically in and out of the asset classes," says Arnott, with his customary mix of zeal and self-assurance. "I believe I can do it. Most institutional boards can't move that fast." As much as Arnott believes in the scientific approach of his indexes, he has never been afraid to rely on his own judgment over numerical precision --particularly when it comes to collecting. In 2007 he promised to give his old friend Harry Markowitz, the Nobel Prize-winning economist, an 80-year-old wine on his idol's 80th birthday. But when the day arrived and Arnott handed Markowitz a dusty bottle of Château Cheval Blanc, Markowitz was surprised to see that it was a year too young. "I was confused," says Markowitz. "Then Rob explained, 'I made it a 1928, because 1927 was an inferior year in Bordeaux'." As Arnott knows, not all old wine measures up. Goldman's top economist Jan Hatzius says there's a 25-30% chance of a double dip, though the most likely outcome is a sluggish, gradual recovery. The recovery has been artificial -- stimulus spending and inventory restocking -- and thus there's no reason to see a return to robust growth. He's particularly concerned about the expiry of the Bush tax cuts, he sees the unemployment rate going back to 10%, and he sees QEII beginning sometime in the next few months. The biggest risk: There hasn't been enough healing to create end final demand. Another big risk: Policy mistakes (e.g. the full expiration of the tax cuts). As for Japan parallels, he notes that the US financial system is significantly better than Japan's was at the beginning of its lost period, however the US is already at the zero-bound of nominal interest rates (like Japan), and there's a large output gap. Left, Jan Hatzius of Goldman Sachs; right, Richard Berner of Morgan Stanley. When the latest unemployment figures are announced on Friday, all of Wall Street will be watching. But for Richard Berner of Morgan Stanley and Jan Hatzius of Goldman Sachs, the results will be more than just another marker in an avalanche of data. Instead, the numbers will be a clue as to which of the two economists is right about where the American economy is headed. Their sharp disagreement over that question adds yet another twist to the fierce rivalry between the firms, Wall Street’s version of the New York Yankees and the Boston Red Sox. Mr. Hatzius is arguably Wall Street’s most prominent pessimist. 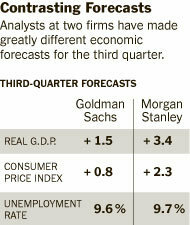 He warns that the American economy is poised for a sharp slowdown in the second half of the year. That would send unemployment higher again and raise the risk of deflation. A rare occurrence, deflation can have a devastating effect on a struggling economy as prices and wages fall. 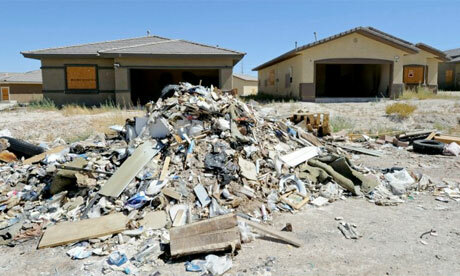 He says he may be compelled to downgrade his already anemic growth predictions for the economy. For months, Mr. Berner has been sticking to a more optimistic forecast, despite growing evidence in favor of Mr. Hatzius’s view. Last week, Mr. Berner was caught by surprise when the federal government reported that the economy grew at a 2..4 percent pace in the second quarter, well below the 3.8 percent he had forecast a month before. Mr. Hatzius came closer to hitting the mark, having projected a 2 percent growth rate. Mr. Berner and his deputy, David Greenlaw, still expect a pickup in the second half of the year, which would help gradually bring down unemployment. They play down the danger posed by deflation, the malady that deepened the Great Depression and contributed to Japan’s lost decade of the 1990s. On Wall Street, both men were among a very small group that accurately predicted the recent recession. Mr. Berner’s long résumé includes stints at the Federal Reserve in Washington and Mellon Bank in Pittsburgh. “I’ve seen plenty of ups and downs,” said Mr. Berner, 64, sitting in a corner office overlooking the Manhattan skyline at Morgan Stanley’s Midtown headquarters. Mr. Berner does not expect substantial inflation, but he is predicting inflation will run 1 to 2 percent annually rather than the near-zero level Mr. Hatzius sees by the end of next year. “There is still a one in 10 chance of deflation,” Mr. Berner calculates. “But we already have been much more aggressive and proactive in dealing with the problem than Japan was,” he said, referring to the Federal Reserve’s decision to quickly cut rates and aggressively buy government securities. The split between the chief economists, whose work helps inform trading strategies recommended to investors by their firms, echoes a broader and sometimes fiercer debate among academic economists and commentators about the threat posed by deflation and what the government’s response should be. According to the deflationistas, as they are nicknamed, a new round of stimulus spending by Washington is urgently required to stave off a Depression-like cycle of falling prices and wages that is difficult to reverse once it is set in motion. Inflationistas, by contrast, worry more about the effect that additional government borrowing could have on the recovery. With the budget deficit expected to hover around $1 trillion a year for the next decade, they say, interest rates could eventually surge, making borrowing — and goods — more expensive. A double dip, they say, is highly unlikely. Mr. Hatzius’s gloomy outlook is owed centrally to Americans’ slowdown in spending. Recent data suggest that consumers are using any extra cash they have to pay down debt or put into savings. That places a strain on an American economy that has become hugely dependent on consumer spending. On Tuesday, the Commerce Department reported that Americans saved 6.4 percent of their after-tax income in June, in contrast to the years before the recession, when savings rates stood at 1 to 2 percent. Last month, the Federal Reserve reported that consumer debt dropped by 4.5 percent in May, a $9 billion decline. It was the 20th consecutive month that figure has dropped. In 2007, consumer debt jumped by 5.7 percent, or nearly $40 billion. Mr. Berner is also studying the role that slack and deleveraging are playing, but he draws very different conclusions from Mr. Hatzius. Excess capacity is being reduced more quickly than Mr. Hatzius believes, Mr. Berner said. That will help businesses raise prices and improve profits, thus heading off the threat of deflation. What is more, Mr. Berner argues that the deleveraging process is much further along than Mr. Hatzius contends, which will encourage consumers to start spending again. He expects economic growth in the second half of 2010 to run at more than 3 percent, roughly twice the 1.5 percent rate Mr. Hatzius projects. If Mr. Hatzius is right, unemployment will still stand at 9.7 percent at the end of next year, slightly higher than it is now. Mr. Berner says he believes unemployment should sink to 8.7 percent by then. As for Friday’s numbers, Mr. Berner is calling for a private sector gain of 145,000 jobs versus Mr. Hatzius’s prediction of 75,000 new jobs. Either way, both predict unemployment will remain at uncomfortably high levels for several years. One answer, Mr. Hatzius says, is another round of stimulus spending by Washington to fend off the deflation risk he worries about. Instead, he and his colleague Mr. Greenlaw argue for new mortgage rules that would reduce foreclosures and steady the housing market, payroll tax credits to encourage hiring and a new job training corps for unemployed workers. The howls of surprised economists were everywhere last week as the government reported on Tuesday that July had sharpest single-month plunge in existing home sales on record. The next day the commerce department reported that new home sales hit a post-war low in July. All the economists who had told us that the housing market had stabilised and that prices would soon rebound looked really foolish, yet again. To understand how lost these professional error-makers really are, it is only necessary to know that the Mortgage Bankers Association (MBA) puts out data on mortgage applications every week. The MBA index plummeted beginning in May, immediately after the last day (30 April) for signing a house sale contract that qualified for the homebuyers' tax credit. What should be clear is that the tax credits helped to pull housing demand forward. People who might have bought in the second half of 2010, or even 2011, instead bought their home before the tax credit expired. Now that the credit has expired, there is less demand than ever, leaving the market open for another plunge in prices. The support the tax credit gave to the housing market was only temporary. It is worth asking what was accomplished by spending tens of billions of dollars to prop up the market for a bit over a year with these tax credits. First, this allowed millions of people to sell their home over this period at a higher price than would have otherwise been the case. The flip side is that more than 5 million people bought homes at prices that were still inflated by the bubble. Many of these buyers will see substantial loses when they resell their house. The banks also had a stake in this. The homebuyers' tax credit prevented prices from declining as rapidly as would otherwise have been the case. This enabled millions of homeowners to sell their home at a price where they could pay off their mortgage. This made banks who could have been holding underwater mortgages very happy. Of course, someone had to issue the mortgage to all those people who bought homes at prices that are still inflated by the bubble. The overwhelming majority of the mortgages issued in the last year and a half are insured by the government, either through Fannie Mae and Freddie Mac, or through Hud. So, taxpayers, not banks or private investors, are carrying the risk that further price declines will push these mortgages underwater. The further plunge in house prices will have serious implications for the course of the recovery. By my calculations, the decline in house prices through the first half of 2009 eliminated $5-6tn of the $8tn of housing equity created by the bubble. Look to the further declines in the rest of this year to eliminate most or all of the remaining bubble equity. The loss of this wealth will further dampen growth. This should drive home the fact that house prices, like the Nasdaq following the tech crash of 2000-2002, are not coming back. Homeowners will have to come to grips with this massive loss of wealth. While many commentators (no doubt, the surprised ones) complain that consumption is low, the reality is that consumption is still at an unusually high level relative to disposable income. Furthermore, with a huge cohort of babyboomers approaching retirement with almost no wealth, there will be more need to save than ever. This need to save is accentuated by the plans of those in the Obama administration and the congressional leadership to cut social security. This means that we should expect consumption spending to weaken sharply in the second half of 2010 and into 2011, as the savings rate rises into the 8-10% range, further slowing economic growth. This comes against a backdrop where final demand had only been growing at a 1.2% average rate over the last four quarters. Final demand is GDP, excluding inventories. Growth was boosted over the last year by the restocking of inventories. This process is largely completed, which means that we should expect GDP growth to be pretty much equal to final demand growth going forward. Starting with a 1.2% growth rate, then throwing in weaker consumption due to further house price declines, state and local government cutbacks, and the winding down of stimulus, it is questionable whether growth will even remain positive over the next four quarters. Given all these negative factors, it is very hard to construct a story showing the economy on a healthy growth path, even though many economists still seem to think it is. Of course, these economists were probably surprised by last month's home sales data.